More whitewashing from the “Take a vote, not a vacation” files. Not much to figure out about this insider propaganda piece above, especially, when one looks to the Nerd’s U of M Ann Arbor alumni ties, and this *coincidence* when rolling through Mrs. Fink’s Twitter timeline. I'm sure that Hillsdale President Larry Arnn is thrilled at the fine example of journalistic integrity displayed by one of his own faculty. She obviously lost her copy. Interesting. 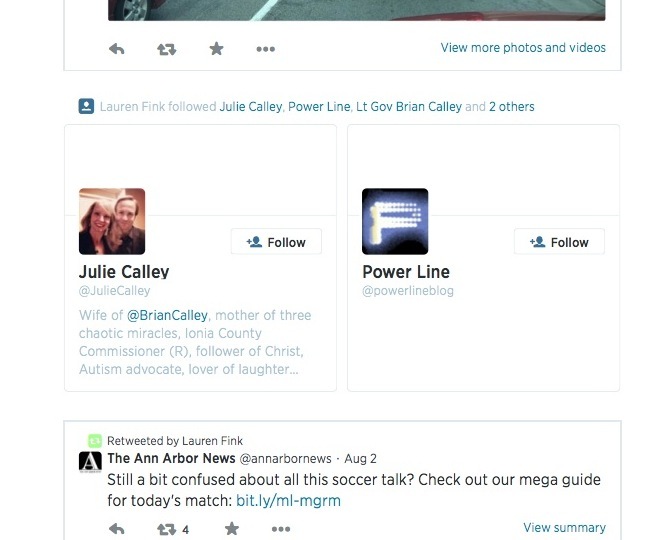 Mrs. Fink has changed the profile pic she had on her Twitter account with her U of M Ann Arbor lawyer husband posing next to her like a retard to the one she is using now. And dig this... "respectful" is now the new "just following orders". Good God the ignorance is thick in that one. Someone really needs to tell her about the Nuremberg trials. Yessirree, poor 'ol Larry Arnn has hired himself a propaganda spewing dunce. She's "respectful" to Lil Gov, yet effectively tells one of the leaders of the Tea Party what to go and do with himself. Cognitive dissonance pops up where you least expect it!